Portland City Manager Jon Jennings has proposed a six-month moratorium on waterfront development in an effort to forestall a citizen referendum to block non-marine construction on the city’s piers. If the moratorium is adopted by the City Council, it would pause commercial developments on the water side of Commercial Street in the waterfront central zone. The zone between the Casco Bay Bridge and the Ocean Gateway ferry terminal includes the city’s surviving fishermen and marine businesses. Booming development on both sides of Commercial Street has raised fears the working waterfront will be pushed out by expensive office and hotel projects, including a luxury complex proposed on Fisherman’s Wharf. A moratorium will give the city, pier owners and marine businesses time to work out a compromise that preserves the waterfront’s character and economic success, Jennings said in an interview Tuesday. If passed by the council, it also could pre-empt a citizen referendum to enforce a strict water-dependent use in the zone, effectively blocking any new development. “I really appreciate the fishermen and pier owners are willing to work with us to come up with what I think is a much better solution than a referendum, which would have a devastating effect on the city,” Jennings said. Fishermen and other marine businesses started agitating last year as they began to feel hemmed in by new hotel, office and shopping developments on Commercial Street. They reported evaporating parking, dwindling access to wharves and vehicle congestion that threatens perishable cargo. The city staff responded to those concerns by fast-tracking a $135,000 operations and master plan for Commercial Street and drafting the moratorium, Jennings said. During the moratorium, a task force would propose changes to deal with longstanding issues surrounding zoning rules, transportation, berthing, zoning enforcement and wharf access. Too much development and vehicle and pedestrian traffic were the top concerns flagged by about 100 people who attended a public meeting about the Commercial Street corridor Tuesday. Many supported preserving the waterfront for marine industries. “Keep the port in Portland,” said Dan Harriman, a lobsterman based on Deakes Wharf. The city has encouraged cruise ships and mega-yachts, and it now feels like there isn’t space for smaller working vessels, Harriman said. His rent has gone up and affordable parking is scarce. 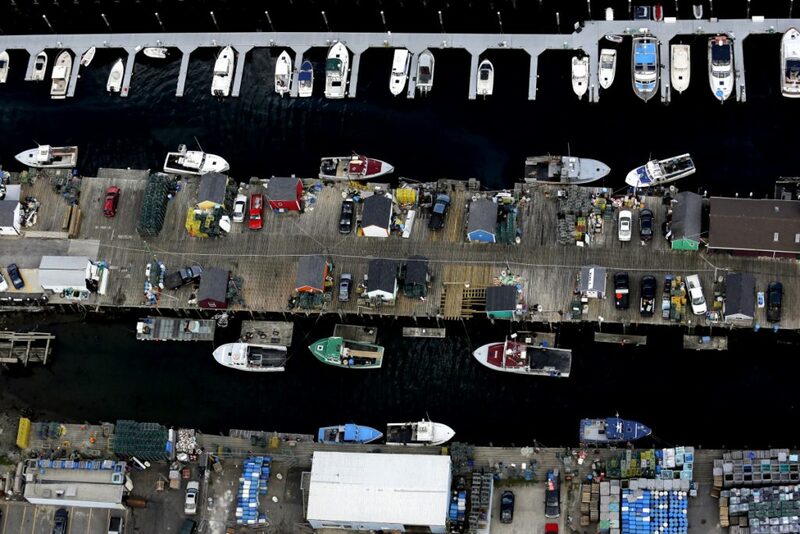 While fishermen feel threatened by non-marine development, pier owners rely on new revenue to pay for expensive upkeep. Part of the task force discussion may involve pier maintenance funding through a tax increment financing district, Jennings said. Charlie Poole, owner of Union Wharf, and Steve DiMillo, owner of DiMillo’s on the Water restaurant, both located off Commercial Street, said in written statements that they support the moratorium. “I’m pleased that all parties are coming to the table to take this time to discuss these important issues so that we can make sure the working waterfront works for all of us,” DiMillo said. A voter-approved referendum would “halt any investment by the pier owners, which would have negative consequences for the fishermen,” he said. Petition organizers like Willis Spear, a Yarmouth lobsterman based in Portland, have yet to be swayed by a city-sponsored development pause. Settling the issues during the moratorium period is a good idea, Spear said, but he wants to hear more before suspending the petition drive. Petitioners need to get 1,500 signatures by Jan. 18 to put the issue on the ballot. A moratorium would not stop some projects, like a new Luke’s Lobster restaurant on Portland Pier. It would, however, halt the advance of a 93-room hotel with parking, offices and retail proposed by developer David Bateman at 184 Commercial St., the entrance of Fisherman’s Wharf. Bateman has asked for zoning changes in the waterfront district to allow the building. The hotel alarmed fishermen, and city staff and elected officials also have concerns about the development. In a news release Tuesday afternoon, Bateman said the $40 million hotel concept has “changed drastically” since it was first proposed, in part to resolve issues raised by fishermen and the public. Fishermen would be the first to see and comment on the new design before it is made public, he said. The City Council is expected to vote Monday on whether to enact the moratorium on an emergency basis. Based on the council’s attitude toward the waterfront, Ray believes it will pass easily. “I think the council has been pretty adamant in its support for the working waterfront and its desire to protect and preserve it,” she said.